"Swerves away from the unexpected..."
ANDREA COHEN’s poems and stories have appeared in The Atlantic Monthly, Poetry, The Threepenny Review, Glimmer Train, The Hudson Review and elsewhere. Her poetry collections include The Cartographer’s Vacation, winner of the Owl Creek Poetry Prize, Long Division (Salmon, 2009), and Kentucky Derby. She has received a PEN Discovery Award, Glimmer Train’s Short Fiction Award, and several fellowships at The MacDowell Colony. She directs the Blacksmith House Poetry Series in Cambridge, MA. a cow fashioned of butter. in an icy room, beneath klieg lights. past a casket at a wake. I thought the cow might have liked to ride. You don’t drive a motorcycle; you ride it. of milk, and dwelled within it. It had a short life span, the butter cow. for nobody, across dry toast. Soon I’ll move to Norway. and by that tree by seen. trees. I’ll be seer and be seen. how it goes, I’m going. a damn about their asses. But I will miss the beeches and the ashes. It’s not their fault I’m leaving. The title of Andrea Cohen’s new collection calls up images of thoroughbreds and elegantly dressed men and women, an occasion compounded from social appearances and animal power. These associations turn out to be apt, for Cohen’s poetry deftly combines verve and grace, close observation and lightning wit. But there is more to the briefest of our yearly national rituals than equine athleticism and fancy hats; as Cohen reminds us in the title poem to her volume, the Derby also encompasses the millions of people, most with only the vaguest interest in horse racing, who stop their lives for two minutes and tune in together, in bars and homes across the land, to a tawdry commercialized spectacle in an unexpressed search for a moment of transcendence and unity. “This is the moment to be in the moment and I / fail terribly,” the speaker of this poem says of her own slightly tipsy and ill-informed viewing. We all do fail, of course, and yet perceiving the way so much yearning and complexity get packed into a fleeting, equivocal event still makes a kind of triumph. And in this density of emotion and insight, disappointment and compensation, the race truly becomes a fitting emblem for Cohen’s art. These poems are dense. Short, often a page or less, they clip along in lines that tend toward skittish brevity and serial enjambment. Cohen likes to use wordplay to move a poem forward, often setting up an expectation in one line and undercutting or deflecting it in the next, at times punning on words’ multiple meanings to make a line speak in more than one register or deploying clichés for the strange, buried poetry in their dilapidated idioms. The total effect is a smart, jazzy verse that has something in common with Kay Ryan’s work and the early poems of Heather McHugh, though Cohen is much less of a formalist than Ryan and less jokey than McHugh. Her real antecedent for this style seems to be one of our greatest but most inimitable writers, Emily Dickinson, some of whose lines provide an epigraph for the book and from whom Cohen has evidently inherited a faux-naïve stance and wised-up tone. It’s high praise indeed to say that Cohen can thrive on such a rich legacy without letting it spoil her own individual initiative. The ambiguous use of lived here—does it mean to suggest that the butter sculpture is alive, or is it simply an idiomatic way of saying where the cow could be found?—as well as the abrupt shift from life to funereal imagery are typical examples of Cohen’s tricky language and the way her style shades into a poem’s thematic concerns. A similar food-oriented playfulness enlivens “The Gates of Paradise,” which Cohen begins by telling us that “The Gates of Paradise / are bitter, my father says,” before clarifying that this refers to her actual, not spiritual, father’s reaction to tasting a dark-chocolate replica of one of Ghiberti’s door panels for the Florence baptistery. Such reversals are fun, but as with Dickinson’s humor, they also point to the way language’s slipperiness mirrors the world’s strange doubleness—its revelations masked as the ordinary, its tragedies that, as in Auden’s “Musée des Beaux Arts,” occur in the background. Cohen has a keen eye for these overlaps and shiftings, the sliding between monotonous and momentous. In “The Universal Truth,” the speaker describes dressing, when she was thirteen, as an old woman and spying through the window of a dime store on her mother, who was buying gifts for a man she was having an affair with. Her mother was “blushing / furtive, unrecognizable,” and the speaker was similarly opaque or invisible since her mother “stared straight back, / not seeing me.” The poem’s losses and discoveries of identity culminate in the speaker’s realization that her mother “would have been / the stranger / I was becoming.” Notice in that last quotation how, once again, Cohen uses language—this time the manipulation of verb tenses, with the past shown both as oddly conditional and as continuing in the present participle—to echo the destabilizing situation itself. In this era of ebooks and cuts to funding for poetry publications, I also want to mention my admiration for the book itself. It isn’t just that Salmon has edited and produced a handsome volume, although the book is a pleasure to hold and read, with good paper, plenty of room on the page, clear typography, a pleasing and compact size. Some American poetry books have lately grown to ungainly lengths, and their complicated layouts, multiple epigraphs, sectioned poems, notes, dedications, and other textual apparatus can make them resemble an unlikely cross between an academic treatise and an elaborate tapas menu. It seems almost a bygone joy to find a poetry collection that is, quite simply, a collection, a set of individual poems arranged sensitively in thematic and motivic sequences to provide variation and contrast, and at a length that falls easily into the category the English call a slim vol. There is a real pleasure in being able to absorb a poetry book in a reading or two and then to return at leisure to deepen the acquaintance, an almost old-fashioned experience that also seems to rhyme with Cohen’s aesthetic. Her work exhibits modesty in the highest sense—an ideal where ambition and ability do not struggle against each other but work in tandem—but the delight it provides, far from being quickly exhausted, is abundant and renewable. Andrea Cohen’s often lovely, sometimes loopy, poetry circulates between death and comfort, between images of inexorable loss and expressions of inexplicable hope. 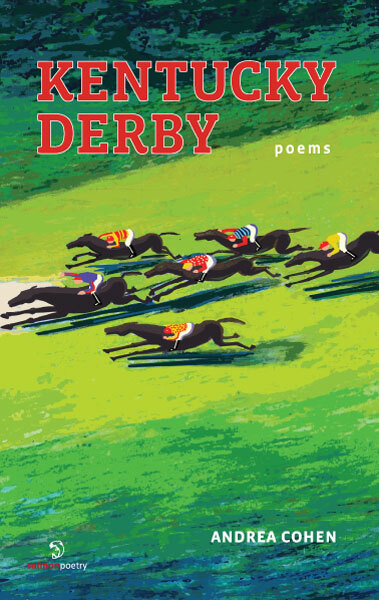 In Kentucky Derby, which just came out, she writes poems with odd titles like “Love Poem with a Trash Compactor” and “Coupons in the Afterlife.” These provide good indications of her m.o. She likes to take slightly outlandish metaphors or odd juxtapositions and coax them wittily back to sense. somewhere back there, not waving, burning. The last image might not be all that surprising in a poem about the Shoah, but it is rendered stranger by its nod to a famously dark work by the English poet Stevie Smith, “Not Waving But Drowning.” It is also made more poignant—almost painfully so—by the notion that Lena’s grandmother’s sacrifice is as tender and as natural as a parent putting a child to bed. all of us being ponies in a meadow. The sea and sky are made of grass. It can’t last. It lasts. The yellow star has become a school bus that goes nowhere but around and does it so safely and reassuringly that its riders fall asleep, become ponies in a land that is so full of milk (or butter) and honey that the very sky is made of grass. A realist would say that a dream like that is just plain childish and that a state of bliss like that just couldn’t last. A utopian would say that it isn’t and that it can. In the end, our redemption is nothing less than the promise of such plenty and such peace.